A1 PQG (Prime Quality Graphics) Blueberry Full Color Oval merchandising labels provide effective and pleasing graphics to attract your customer, engage them and then communicate your message with style, clarity and effectiveness. This product, through A1 Design refinement and perfection, qualifies for the PQG designation. The Blueberry Full Color Oval merchandising labels can be ordered and used as a stand-item, or as part of a branding campaign for your store. This merchandising label is part of the Bakery Labels Collection. 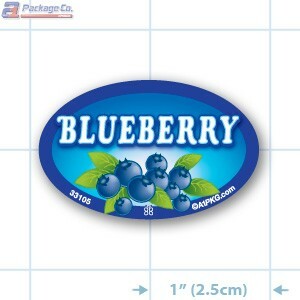 The A1 Team appreciate the opportunity to present you with our A1 PQG Blueberry Full Color Ovals, 1.875 x 1.1875", pressure sensitive labels and Thank You for considering or purchasing our products.